Emphasises the individuality of every ECG and uses full 12-lead ECG recordings to provide a realistic reproduction of the clinical environment. Each chapter begins with a brief account of the relevant history and examination and ends with a short account of what might be done once the ECG has been interpreted. Now integrated throughout the book is text on electrophysiology and electrical devices. With pacemakers and implanted defibrillators now common among patients on general medical take, this material guides the reader in recognising their purpose and making a preliminary analysis of any malfunction. This book offers 150 12-lead ECGs and rhythm strips, each with a clinical case history and question. The full ECG is reproduced and a study of it with the case history should be enough to give an answer. On the back the case is examined, with a description of the main features of the ECG along with a clinical interpretation and a "what to do" section. 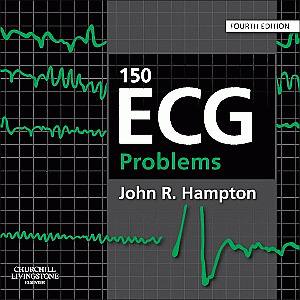 The cases are graded in difficulty.For this Fourth Edition over 30 new ECGs have been included, mainly to provide clearer examples, though the book deliberately retains some technically poor records to maintain a 'real-world' perspective. Revised and updated for its Fifth Edition, Pathophysiology of Heart Disease delivers a concise, easy-to-understand introduction to cardiovascular diseases. This best-selling text is written by internationally recognized Harvard Medical School faculty and select medical students and specifically designed to meet the needs of medical students during their initial encounters with patients with heart disease. This edition has improved consistency of coverage and level of detail and enhanced illustrations. A companion website on thePoint will include the fully searchable text and audio heart sounds, plus an image bank for faculty.